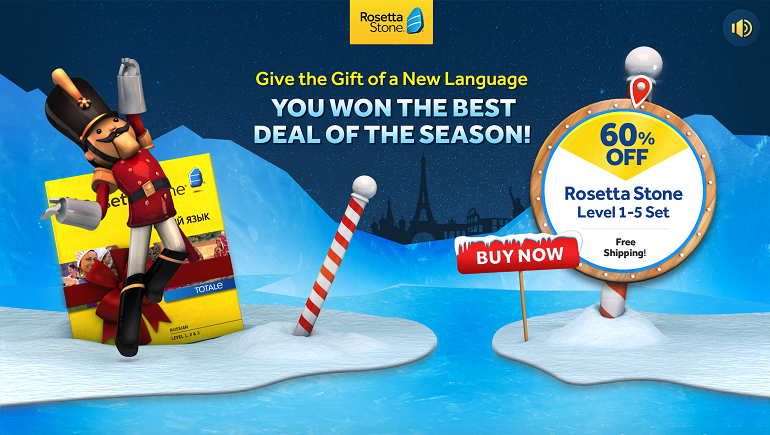 Rosetta Stone came to Brand Flights to create their first rich media campaign to build brand awareness and customer engagement for the 2013 Holiday season. And they came back for more in 2014! We built a custom media plan to target new customers who are in­-market for learning a new language, and engaged them with an animated, gaming experience. The Nutcracker character dances out with glee, offering customers a chance Spin to Win….the best deal of the year. The full­ page takeover ads drop­-in for in-­market customers, and user-­enabled audio completes the super immersive experience. Once the wheel stops, customers can click through to a matching landing page to redeem their winnings. The media plan optimizes for conversions with matching rich media expandable units to remind customers to collect their prize before the magical deal disappears. A most wonderful time for everyone at Brand Flights working with the incredible team at Rosetta Stone!